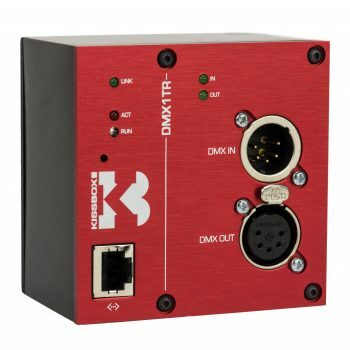 The KissBox DMX1TR Transceiver allows you to use a standard Ethernet network to distribute the DMX-512 protocol to any part of your system. 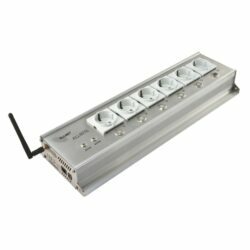 You can configure it to behave as an external DMX interface for a PC, Mac or generic lighting controller. Multiple DMX1TR units can be set up to work together and manage up to 64 universes of DMX across the network. The DMX1TR Transceiver can be set to use the Artnet protocol or Kissbox’ simple to implement TCP-IP KissBox protocol. Sends and receives DMX-512 over Ethernet. Acts as standard DMX interface. PoE Switch or PoE injector is needed.